Quite often HR Advisors at Quest get the above query coming up especially where the employee has moved on to work for a competitor. The starting point is quite simple, where employees have signed their employment contracts, they are bound by its terms even if they do not bother to read it (subject to misrepresentation or fraud on the part of the employer). To be legally binding, a contract of employment does not have to be in writing however under the Employment Rights Act 1996 there is an obligation for the employer to provide each employee, whose employment is to continue for more than one month, with a statement of written particulars of employment within two months of the employee’s start of employment. However, there is no statutory obligation to have the contract of employment or the written statement signed by the parties. In looking to decide whether or not an unsigned contract would be enforceable, the Court will consider the behaviour of both the employer and employee in particular. Has any money changed hands for services provided by the employee? i.e. if salary has been paid and the employer and the employee actually conducted themselves within the terms of the contract to give rise to presumed acceptance of the terms (as long as the terms are reasonable). To prevent the possibility of complications and uncertainties, it's still good practice for employers to iron out any possible ambiguities by following up on any unsigned contract early in an employment relationship, or each time the contract is updated by arranging a meeting with the employee to identify the reasons why the contract remains unsigned. 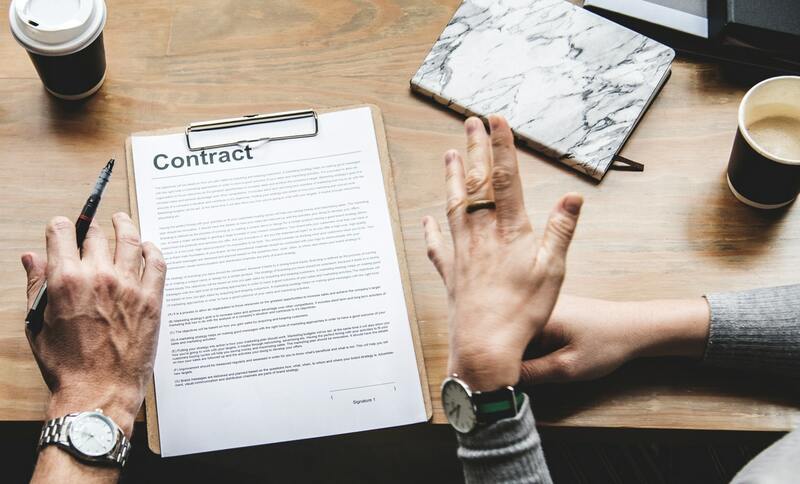 Where the contract remains unsigned and the employer thereafter is looking to enforce the terms herein like restrictive covenants, case law suggests that there are certain circumstances when terms in an unsigned contract may be enforceable. Each case will turn on its own facts, but the following cases provide an indication of how matters could be addressed by the Courts. In the case of FW Farnsworth v Lacy 2012, the employee was promoted to a senior position and sometime thereafter was offered a new employment contract which incorporated new benefits to include private medical insurance and a new defined contribution pension scheme. It also incorporated post termination restrictive covenants, such as a non-competition provision. The employee never signed the new employment contract but did opt in for two new benefits offered under its terms. The employee subsequently began working for a rival company in breach of the restrictive covenant. The High Court held that by applying for the benefits, the employee impliedly accepted all the terms of the new employment contract, including the restrictive covenants from the date that he applied for private medical insurance. Another recent case of Tenon FM Ltd v Cawley 2018 goes the other way and highlights the risks of not only getting employment contracts signed, but also making sure records are kept up-to-date with signed contracts for all employees. In this case the employee, Ms Cawley, was employed by Tenon FM Ltd, from 2008 until she resigned in 2018. During her period of employment, she was promoted several times finally to Operations Director. After resigning, Ms Cawley began working for a rival company. Tenon alleged that in doing so Ms Cawley was in breach of the restrictive covenants in her latest employment contract. However, Tenon were unable to produce a signed copy of the latest contract dated 2012, nor were they able to produce a signed copy of the 2011 contract which contained identical covenants. In the absence of a signed contract containing the relevant restrictive covenants, the Court had to decide whether Tenon could establish that Ms Cawley was bound by the covenants and it was held that Ms Cawley could not be bound by restrictive covenants that she had not signed and it was not possible to infer acceptance of the covenants from Ms Cawley's conduct by continuing to work for the company after being issued with a new employment contract. It will only be possible to infer acceptance of new employment terms from conduct, where the new terms have an immediate effect on the employee and on the facts, there was no such immediacy as the restrictive covenants only applied to post-termination. The Court took into account that Tenon had an established HR department with HR Manager and yet were unable to locate even one signed employment contract for Ms Cawley which suggests that employers who have a designated HR department will be held to a higher standard of compliance to ensure that all personnel files are kept up-to-date. With variation of terms during employment, the Court also noted that Ms Cawley had not been provided with any consideration for either of the revised versions of her employment contract, which is further warning to employers, to ensure that employees receive adequate consideration when entering into a variation of their existing employment contract, like a slight increase in salary or some other minor benefit provided. Also, the Court drew a comparison between Ms Cawley's employment contract and that of her colleague's contracts. The restrictive covenants that Tenon sought to rely on was not present within at least two other members of the company's senior leadership team. This stresses the importance of keeping restrictive covenants consistent between employees. Tenon had spent approximately £200,000 in making the application for injunctive relief and failed to get such relief hence the moral of the article is that employers must make sure that they get employees to sign contracts of employment to avoid uncertainties and potential litigation costs. Simplify the issues you face as a business owner. Download our legal checklist for small businesses here.